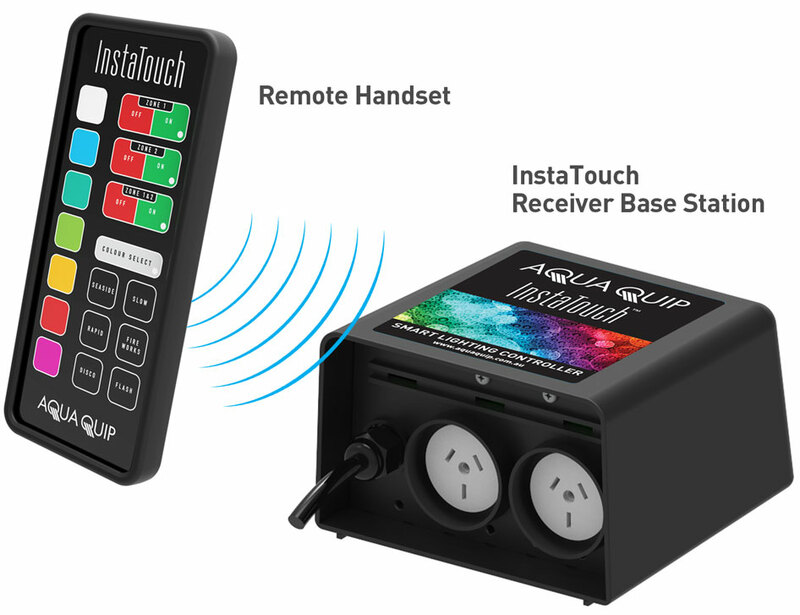 InstaTouch is the new smart remote controller for your LED Pool Lights. Welcome to the world of Instant colour, where Aqua-Quip’s spectacular underwater lighting effects are controlled at your fingertips. • Intuitive touch-screen wireless handset allows you to instantly select colours for your pool, spa or water feature. • The wireless handset is robust and water-resistant – whilst retaining a slick and stylish appearance. • Control two lighting zones independently, with a wireless handset that has extended range. • Choose from 7 fixed colours and 6 colour shows, or choose and save your own fixed colour. • No need to replace your existing cables and transformers. • Enables lights to be dimmed. • Simple to install, plug and play.